THE L.C EXPERIENCE: Cops are looking for Suge Knight...AGAIN! 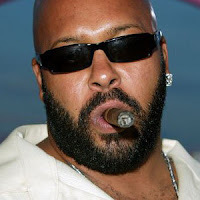 Cops are looking for Suge Knight...AGAIN! According to TMZ, cops are looking for Suge again. This time for missing a court appearance in L.A. last week stemming from a 2009 incident where he was ticketed for driving with a suspended license. In just the last several months, Suge's been accused of beating up and robbing rapper Yukmouth of the rap group The Luniz (Yuk denies this happened). He was charged with assault with a deadly weapon in May. And just last week the former Death Row Records kingpin was hit with a restraining order and told to stay away from a man who claims Knight threatened his life. Suge maybe you need a new focus. Cops, court & prison just ain't as fun as it used to be lol.